lives in Ghent For Contour 2003, Honoré d’O made a video installation, together with Franciska Lambrechts, with ten monitors and one large projection in the Saint John’s Church. Called Mixed Commission, the theme was: “how do I carry out an assignment in a religious context in our modern age?” The centrepiece was a free interpretation of The Last Supper. For Contour 2005, he provides a new form of moving image that is closely connected to the history of the medium: a light that flickers in the dark, like in theatres and on the tv screen. 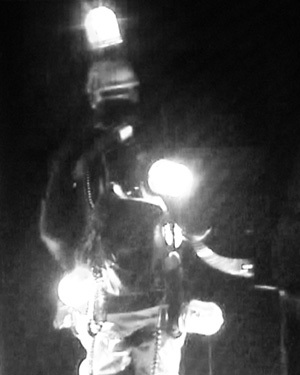 A figure, decorated with lights, wanders through the different locations of the exhibition. Like the first line of a poem, to be completed by the spectator.